Tai chi is an ancient Chinese mind-body exercise that combines physical movements with meditation. There are various forms of tai chi, including tai chi chih, which uses gentle movements that may be performed standing or sitting. Numerous research studies, in healthy subjects and younger cancer survivors, have suggested that tai chi is associated with many physical and mental health benefits such as improvements in physical functioning, balance, and sleep quality. However, it is unknown if tai chi affects quality of life and offers benefits to older cancer survivors. Campo and colleagues conducted an NCI-funded* pilot study that examined the feasibility of using a tai chi intervention in senior female cancer survivors. In this study, senior cancer survivors (aged 55 years or greater) with some physical functioning limitations were randomized to participate in a tai chi chih (TCC) intervention or a health education control (HEC) group for 12 weeks. At the beginning and end of the study, participants completed a questionnaire related to quality of life and provided comments about their assigned group. Sixty-three women participated in this study. The overall retention rate for the 12-week intervention was 86%, with 3 out 32 subjects withdrawing from the TCC group and 6 out of 31 subjects withdrawing from the control group. Overall attendance (for both interventions) was 81%. There was no difference in quality of life scores between the two groups at the end of the study, although participants from both groups had improved scores compared to the beginning of the trial. The results of this study, recently published in Integrative Cancer Therapies**, suggested that a TCC intervention is feasible in senior cancer survivors. Although TCC did not significantly improve quality of life scores compared to the health education program, subjects in the TCC group experienced mental and physical benefits. According to the authors, “Participants reported that TCC helped them feel more relaxed, less stressed, and better emotionally. Physically, they reported that TCC helped with balance, increased energy, and improved sleep.” Subjects from both groups commented that they enjoyed the social aspects of the TCC intervention and HEC, and this may have helped improve quality of life scores. 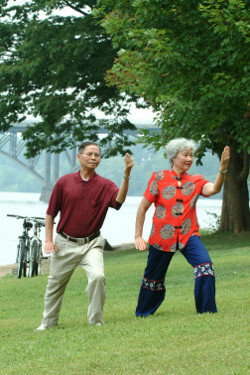 The authors suggested that “a more appropriate control for the TCC intervention could have been a music relaxation group that consisted of participants quietly listening to music, without group discussions of participants’ cancer experiences.” However, they went on to note that tai chi studies in healthy adults have shown significant differences in quality of life measures compared to HEC groups. **Campo, R.A., O’Connor, K., Light, K.C., Nakamura, Y., Lipschitz, D.L., LaStayo, P.C.,… & Kinney, A.Y. (in press). Feasibility and Acceptability of a Tai Chi Chih Randomized Controlled Trial in Senior Female Cancer Survivors. Integrative Cancer Therapies.